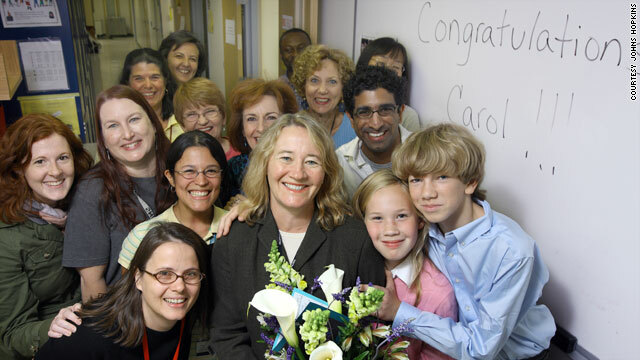 Dr. Carol Greider, center, was feted by her son, daughter and her colleagues at Johns Hopkins School of Medicine on October 5, the day it was announced that she won the Nobel Prize for Medicine. Watch for Health Minute on HLN, 10 a.m.-6 p.m. ET weekdays. Baltimore, Maryland (CNN) -- She was folding laundry when the call came at 5 a.m. After she hung up the phone, Dr. Carol Greider went upstairs to wake her children. She had to tell them, even if it meant getting them out of bed early. "I said, 'By the way, I just won the Nobel Prize. You can go back to sleep now,' " she recalled. Until this past October, many would have described Greider as your typical working woman. A molecular biologist at Johns Hopkins School of Medicine and the mother of two children -- Gwendolyn, 10, and Charles, 13 -- she splits her time between job and family. But "typical" no longer applies. Winning the 2009 Nobel Prize for Medicine may help her career, but it hasn't changed her attitude about home life. "I could have basked in the moment, but I had to tell my kids first. And they were thrilled, but then they wanted to know, 'Do we have to go to school today?' " she said. "Of course I said, 'No, you don't.' And they came to work with me." The Nobel Prize and Prize in Economic Sciences have been awarded to women 41 times between 1901 and 2009. Only one woman, Marie Curie, has been honored twice. Ten women, including Greider, have received it for medicine, others for economics, physics, literature and chemistry; 12 have won the Nobel Peace Prize. But few have been single moms, whose thoughts are just as consumed by homework as by helices. It's not like the Academy Awards, where you know you may be up for it. It just comes with a phone call. Greider, 48, along with her mentor Dr. Elizabeth Blackburn from the University of California, San Francisco, and Harvard scientist Dr. Jack Szostak, were given the Nobel Prize for their work with telomeres, which are the bits of repeating DNA at the end of our chromosomes. Telomeres protect the chromosomes, much like the plastic tips on shoelaces keep lace from fraying. The research team was also recognized for its discovery of telomerase, which is the enzyme that causes the chromosome ends to stay intact when they divide. Understanding telomerase is important when looking for clues about aging and cures for degenerative diseases and cancer. Born into a family of scientists -- her mother was a biologist; her father was a physicist -- Greider knew her passion was in the lab. And although she suffered from dyslexia, her stellar grades got her into graduate school at the University of California, Berkeley, where she worked with Blackburn. Blackburn had been looking for an enzyme that helped telomeres stay intact. But it was Greider who had the "Eureka!" moment during routine research. She actually discovered the enzyme, telomerase, while making a random, small change in her experiment. The rest, as they say, is scientific history. "At the time we made this discovery, it was just a fundamental, curiosity-driven question," she said. "But we've been able to link that up to important medical consequences." Although the initial discovery happened 25 years ago, Greider knew there was always a chance the Nobel Committee could recognize her accomplishments. "Every year or so, I was told maybe this year, it could happen, this could be the year," she said. "But there are no nominees -- it's not like the Academy Awards, where you know you may be up for it. It just comes with a phone call." I live a pretty normal life. So when the call did come, it was a shock to Greider -- but a pleasant one. She is taking 16 friends and relatives to Stockholm, Sweden, to be with her when she receives her prize December 10. There will be parties and seminars to attend, and she wants it to be a special moment for everyone, especially for her children: "I want to pick the best events for them so they aren't bored and they can always remember it and be able to share the moment with me." As for the money -- she'll split the $1.4 million purse three ways -- she's still not sure what she'll do with it. "I'd like it if it could give me more freedom to work in the lab, which is my first love. And I'd like to imagine all the wonderful things it could bring to my future," Greider said, before returning to reality. "But right now, my kids are in school, and I still have to make them lunches and dinners. And all that will keep me grounded." "I live a pretty normal life," she says. Still, it's not everyone who can think back to the morning of October 5, when the Nobel Committee made its call. "I got a big kick out of telling my spinning instructor I couldn't make it to class that day. I sent her a an e-mail saying, 'Sorry, can't make spinning. I just won the Nobel Prize!' "